What does the rose and the Metrolink train arriving in Santa Ana have in common? Well Metrolink ran New Year's Day Trains from San Bernardino and Oceanside again in 2004 but this year passengers could use the new Pasadena Gold Line to reach the Rose Parade and/or the Rose Bowl. I decided to ride this year's train not to go to Pasadena but to be able to ride to Los Angeles to catch Amtrak 761, the 6:55 AM departure to Goleta. I would take this train to Carpinteria and layover there until 774 from San Luis Obispo would return me to Santa Ana. I purchased my Amtrak tickets at Santa Ana and would have to wait until New Year's Day to get my Metrolink Ticket out of the machine in Santa Ana the morning that I would be leaving. With Metrolink arriving early I got to Track 8 just after the combined train sets of 761 and 564 had been brought into LAUPT. The boarding call came at 6:45 AM and I entered a very nice and warm Surfliner train on a very cold morning with me thinking, "At least I'm not in Pasadena this morning". Train 761 departed LAUPT for Goleta with just three paying passengers aboard. A man going to Chatsworth, myself for Carpinteria and another gentleman for Santa Barbara. Add to this total was just a single dead heading employee and that was our passenger load for the entire trip. It was a beautiful morning for a train ride, too bad no one else thought of joining us. The first light of the morning began to take hold as we neared Glendale. Our consist was Surfliner Cab Car 9604, Coaches 6412 and 6408, Cafe-Coach 6302 and Business 6800 with engine 458 pushing the train north. Our arrival surprised the Amtrak agent there who did not even know we were running this morning. We dropped off passenger number three at Chatsworth and then there was only two paying passengers left. The trip through the rocks and tunnels west of Chatsworth made me think that I was on the Southern Pacific Morning Daylight run back in the 1940's as we were basically on the same schedule of that great train. Our train passed the beautifully restored Santa Susana Depot before arriving in Simi Valley. The Chicago song "While the city sleeps" was playing in my head this New Year morning. At Moorpark we met Surfliner 768 heading south for San Diego from Goleta. We made our way to Camarillo, Oxnard and Ventura with not a single soul boarding our train this morning. Now the trip's highlight of the morning. After we crossed the Ventura River we started our shoreline running along the Pacific Ocean. All too quick we passed Seacliff siding then Rincon Point arriving into Carpinteria right on time at 9:05 AM where this paying passenger detrained leaving only one. Following a thirty minute layover at Carpinteria where I bought a Coca-Cola from a machine and told stories of baseball stadiums and train rides to a train attendant and a waiting passenger heading to Oceanside. Surfliner 774 pulled into Carpinteria right on time and I boarded finding a train with people on it. I took an inland forward facing seat for the relaxing trip back to Santa Ana, retracing my entire route of earlier this New Year's Day morning. We met Surfliner 763 at the east end of Camarillo. Our train consisted of engine 453, Business 6804, Cafe/Coach 6803, Coach 6407, Superliner Coach 31018 and Cab Car 6953. At Las Posos our train was greeted by a red signal by the Metrolink Dispatcher. Bob Risky, an outstanding Amtrak conductor boarded in Simi Valley and rode into Los Angeles with me. He told me that the Coast Starlight did not arrive into Los Angeles until 4:00 AM this morning and that we would not be delayed by it. 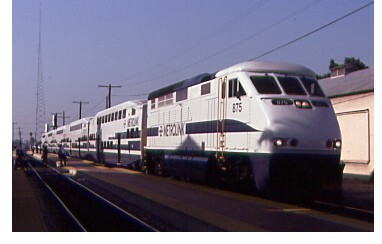 In fact, we met the Coast Starlight after we did our station work at Glendale. We arrived at LAUPT at 11:49 AM for our layover where I met the Ken Ruben the official caller of Lets Talk Trains. We departed Los Angeles after a crew change right on time. BNSF had returned to life as we passed Hobart Yard but our only meets to Fullerton was Amtrak 573 at Buena Park and a BNSF Stack Train at Basta. We left Fullerton on time followed by Anaheim and then Santa Ana where I ended this New Year's Day 2004 adventure on both Metrolink and Amtrak.